Smart Portable sonar – Deeper™ Fishfinder was not only nominated but also took the prize as the best fishing accessory at an annual Australian fishing event – Australian Fishing Tackle Association Awards, which was held on 26-28th of July, 2015. Australian Fishing Tackle Trade Show or simply 2015 AFTA is organized every year and takes place in Gold Coast, Australia, where annual award ceremony is held too. This year as usual, tackle retail attendees gathered together to decide which new gear is worth to be called “the best”. Therefore, AFTA participants voted for the most successful new fishing products in the market covering 26 categories such as rods, lines, lures, accessories and many more. 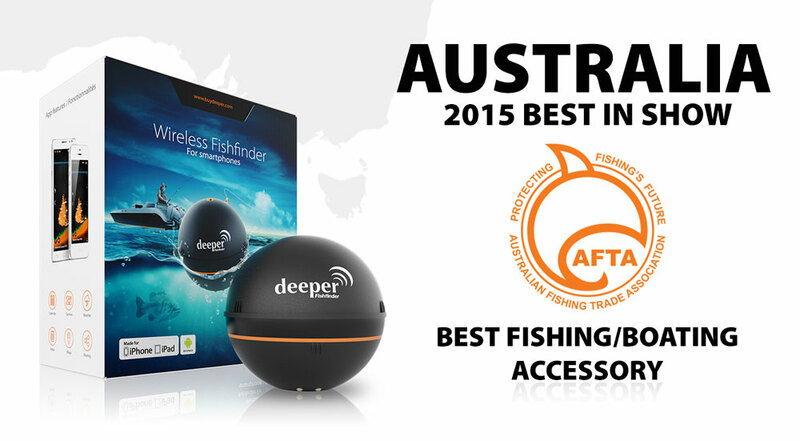 One of the winners at the 2015 AFTA Trade Show was a tennis ball sized Deeper™ Fishfinder. Deeper™ was brought to 2015 AFTA by Rapala VMC and won the prize of the Best Fishing or Boating Accessory of the year. A tiny wireless fishfinder rivaled it’s opponents and proved to be the most exciting smart fishing gadget of the year, making the whole Deeper™ team proud and ready for new challenges. However, 2015 AFTA wasn’t the only event, which spotted Deeper™ . The team representing smart portable sonar also participated in other world class events like European Fishing Tackle Trade Exhibition (EFTEX) and the world’s largest sportfishing trade show – ICAST. It was a great chance to broaden distribution channels, find new business partners and spread the word about Deeper™ among professional anglers from all around the world. Boat Mode 4.0 app novelty was one of the reasons why Deeper™ was noted by international anglers and received 2015 AFTA award. Boat Mode 4.0 allows pro and amateur anglers to create personal bathymetric maps and access full data history. In order to get more information about recent app update , please head here.